It was still dark as we donned our cycling gear at the shopping centre car park early on Sunday morning. 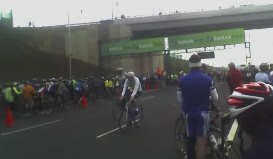 The chill morning air froze our faces as we cycled along the new blemish-free tollway surface to the event start point. A crowd of keen cyclists grew rapidly and soon a tangle of bright coloured Lycra and aluminium frames surrounded us and stretched as far as we could see. We stood shivering under an overpass waiting for the starters signal. I was anxious amongst the group worried I’d struggle to hold my space amongst the forward jostling. The signal sounded and it began, slow at first as the crowds shuffled forward, then the cleats clicked into place and we were off. The downward run towards Frankston was unexpectedly well-spaced and smooth allowing me to enjoy the building momentum as we all gathered speed and settled into our varying comfort zones. Groups formed and reformed. A spill of bikes and riders caused us all to slow as the cry of “stopping” rippled back through the palaton. 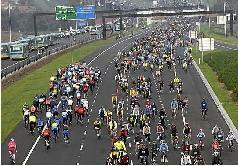 This event promoted the completion of the Eastlink Tollway. Reports varied from 40,000 to 100,000 people who turned up to either cycle, walk, run or roller-skate this new expanse of bitumen. Six friends from our regular Saturday morning cycle group enjoyed the challenge of the 65 kilometre looped course. My time was 2 hours and 11 minutes averaging about 30km/hr, which is pretty good for me. It was a rare chance for cyclists to ride on good roads with plenty of space and no cars to be concerned about. This entry was posted in Uncategorized and tagged cycling, Eastlink by suesbent. Bookmark the permalink.